Is the banana slug disappearing from Gig Harbor? 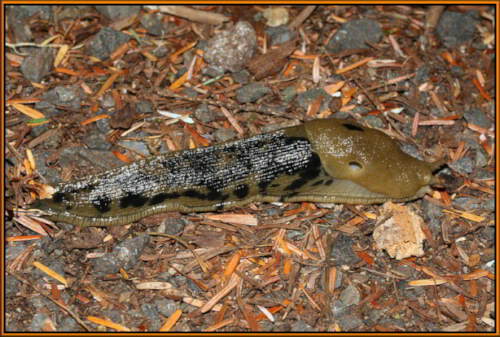 The banana slug (Ariolimax columbianus) common to the Pacific Northwest has, apparently, disappeared from parts of Gig Harbor, Washington. The banana slug will go into a type of dormancy similar to hibernation called “estivation” in a hot dry climate. Even so, in many areas that remain wet, moist and shaded the banana slug will be evident all spring, summer and fall. The banana slug presence, if not in plain site, is evident by the slimy trail of mucus which they secrete as a protective layer. Gig Harbor gardeners may experience the destruction that banana slugs cause in a garden. Hosta plants are a favorite target for slugs. The full undamaged leaves of the Hosta plant indicates an absence of banana slugs. The use of slug poison by the gardener may explain an intact undamaged Hosta. The GigHarborTimes observes that this summer has provided relief from the insatiable banana slug. However, we hope that the disappearance is only temporary. Banana slugs perform an important service in the environment by eating leaves, dead plant material and animal droppings which are excreted as a rich natural nitrogen fertilizer. Will the banana slug return to Gig Harbor? We don’t have the answer to that question. But as slimy as they are, we look forward to a mild wet spring and the return of the banana slug. Located on the beautiful Southern California pacific ocean coast, the San Onofre nuclear power generation plant is being closed because of problems in steam generator systems according to a report in today’s LA Times. The Gig Harbor Times applauds this decision not because the nuclear plant is old and worn but because it represents a monstrous hazard in terms of environment, health and safety. 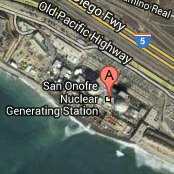 The San Onofre nuclear plant sea wall is 25 feet tall. It was designed to withstand a 7.0 earthquake according to a March 2011 LA times article . The geological fault most likely to directly threaten the San Onofre nuclear plant lies about 5 miles offshore according to the article. Consider the tsunami that destroyed the Fukushima Daiichi nuclear power station. Additionally, the Tohoku tsunami earthquake in Japan lowered the ground (subsidence) by one to four feet. The sea wall designed to protect the town of Kamaishi was easily overcome. “Fukushima” is the nuclear power plant. “Tokoku” is the main earthquake generated tsunami. “Kamaishi” is the town with the sea wall that was overcome.